$6.85 A light, non-greasy and fast-absorbing hand and body moisturizer. Soothes and softens rough, dry and chapped skin with essential oils of lavender and geranium. Why lavender? Think of lavender as a skin food. It is packed with antioxidants to protect and nourish your skin. Why geranium? Since the days of Cleopatra, geranium oil has been used to promote beautiful and radiant skin. 16 oz. 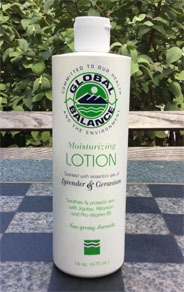 This plant-based lotion does not contain mineral oil, petroleum jelly, lanolin, propylene glycol, carbomers, TEA, synthetic fragrances and colors. It also does not contain any ingredients made with ethylene oxides such as PEG, emulsifying wax and polyoxyethylene ethers and esters. These ingredients may form 1, 4-dioxane. This product has not been tested on animals and there are no animal ingredients. An effective, deodorizing and moisturizing body wash for shower or bath. Scented with pure essential oils of lavender, geranium, siberian pine needle and patchouli for a clean, fresh feel. 16 oz.